This Persistence Market Research report examines the scoliosis management market performance for the period 2018 to 2028. The primary objective of the report is to offer updates and insights regarding various market opportunities in the global scoliosis management market. Scoliosis is a spine disease in which the spine becomes S-shaped or C-shaped. It causes the body to look uneven from the shoulders, hips or waist. Since the cause remains unknown it is called idiopathic scoliosis. The bend or the curvature can occur on left or right side. Moreover, the degree of magnitude decides the treatment options, thereby creating a need for Scoliosis management. Exercises, braces and spinal fusion are the main treatments for scoliosis management. Generally, people suffering from scoliosis prefer using customised braces as the treatment is less expensive as compared to the surgery. The customisation of the braces depends on the degree of curve. If not treated the degree of curvature progresses, which can lead to difficulty in breathing. The scoliosis management market is witnessing increasing adoption of braces for its treatment. To provide an accurate understanding and to assess the opportunities in this market, the scoliosis management market report is categorically split under four sections, namely market analysis by product type, age group, distribution channel and regions. The report analyses the global scoliosis management market in terms of market value (US$ Mn). The report starts with an overview of scoliosis management and usage in various products in regions across the globe. In the same section, the report covers the scoliosis management market performance in terms of revenue. This section includes an analysis of key trends, drivers and restraints from supply side and demand side perspective for the scoliosis management market. To arrive at market size, the report considers average price of scoliosis management across geographies. The forecast presented here assesses the total revenue of the scoliosis management market. When developing the market forecast, the starting point is sizing the current market, which forms the basis for the forecast of how the market is expected to take shape in the near future. Given the characteristics of market, we have triangulated the outcome based on different analysis based on supply side, demand side and GDP growth rate. However, quantifying the market across aforementioned segments and regions is more a matter of quantifying expectations and identifying opportunities, rather than rationalizing them after the forecast has been completed. In addition, we have taken into consideration year-on-year growth to understand the predictability of the scoliosis management market and to identify the right opportunities across the market. As previously highlighted, the market for scoliosis management is split into various sub-segments based on regions, product type, age group and distribution channel. All these sub-segments or categories have been analysed to understand individual segments’ relative contribution to the market growth. This detailed level of information is important for identification of the many key trends in the scoliosis management market. Also, the revenue forecast in terms of absolute dollar by regions, product type, age group and distribution channel value is another key feature of the scoliosis management market report. This is traditionally overlooked while forecasting the market. However, absolute dollar opportunity is critical in assessing the level of opportunity that a provider can look to achieve, as well as to identify potential resources from a sales perspective. Furthermore, Persistence Market Research has developed market attractiveness index for all the four segments—regional, product type, age group and distribution channel. This index helps in identifying the real opportunities available in the market. In the final section of the report, the scoliosis management market landscape is included to provide report audiences with a dashboard view, based on categories of providers across the market, presence in scoliosis management product portfolio and key differentiators. 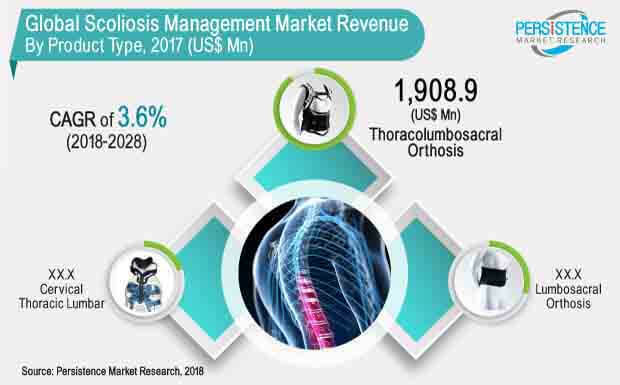 Scoliosis Management Market has different products one of which is a CTLSO (Cervical Thoracic Lumbar Sacral Orthosis) brace which is a two piece with metal cervical attachment that supports the neck and the back region and prevents the movement of the spine. It is used for the treatment of upper back deformities and the neck. If the braces are removed, the curve may return to its original position and may increase progressively. The second type of product in scoliosis management market is a TLSO (Thoracolumbosacral Orthosis) brace is used for mid to lower spine area. The braces are placed and customized according to the degree of curves. The pads in the braces provide pressure to slow down the growth and progression for scoliosis mangement. It is prescribed to children with degrees in between 20 and 40. These braces provide partial movement and adjusts to accommodate the growth of the body. Moreover, if the magnitude of the curve does not increase while wearing the brace then the person can avoid spinal fusion surgery. Juvenile scoliosis is diagnosed between the age of 5 and 9 years for scoliosis management market. During this age, scoliosis tends to grow faster, i.e., it becomes progressive and does not disappear on its own. Generally, juvenile patients suffering from scoliosis develop a right bend. As scoliosis is progressive in this age the brace treatment is given to the patients that strengthens the spine and restrains the progressiveness of the spine. The braces need to be changed with the growth of the child in 12–18 months as the degree of curvature will also change. Adolescent scoliosis occurs between the age of 10 and 18 years. Although the cases are unknown, it can happen due to hormonal imbalance, ayes-metrical growth and muscle imbalance. Physical therapies and treatments are done if the degree of curve is between 10 and 20 degree. While if the degree of curve is between 20 and 40 degree, the braces are used to prevent the progressiveness. These braces have to be worn constantly for 22–23 hours a day for an effective result which pushes the growth of scoliosis management market. The global scoliosis management market has been estimated to be valued at US$ 2,460.4 Mn in 2018 and is expected to expand at a CAGR of 3.6% over the forecast period (2018–2028). The growth of the global scoliosis management market is mainly driven by high prevalence of the disease, high adoption rate of braces and advancement of technology with tracking devices, which can monitor the health of the patient. Furthermore, increasing demand for non-invasive therapies is expected to drive the market for scoliosis braces. The disease occurs equally in both the genders but the degree of curve progresses 8 times higher in females than in males. However, the device has to be worn 22–23 hours a day by the patient so it stiffens their body causing irritation and rashes to the skin. Also, it squeezes the chest wall and abdomen and causes breathing problems, which can affect the oxygen flow and pulmonary functions. The global scoliosis management market is expected to witness growth over the forecast period. Moreover less expensive braces along with increasing awareness among people are some of the factors expected to increase market growth over the forecast period. The global scoliosis management market is segmented on the basis of product type into cervical thoracic lumbar, thoracolumbosacral orthosis and lumbosacral orthosis. In terms of value, the thoracolumbosacral orthosis sub-segment is been estimated to account for 80.3% share of the global scoliosis management market by 2018 end, and is projected to register a healthy CAGR of 3.8% in terms of value over the forecast period. By age group, the global scoliosis management market is segmented into infantile scoliosis, juvenile scoliosis and adolescent scoliosis. Among the age group segments, the adolescent scoliosis sub-segment is expected to witness impressive growth during the forecast period. By distribution channel, the global scoliosis management market is segmented into hospital pharmacies, retail pharmacies and online sales. The online sales sub-segment is expected to dominate the overall scoliosis management market with a CAGR of 3.9% in terms of value over the forecast period. The global scoliosis management market has been segmented on the basis of regions into North America, Latin America, Western Europe, Eastern Europe, Asia Pacific excluding China (APEC), China and the Middle East & Africa (MEA). In terms of market value, North America is projected to dominate the global scoliosis management market in terms of revenue share throughout the forecast period. Manufacturers are developing products for scoliosis management marketE that have the potential to push the spine into a correct position with their customized fitting. Latin America and APEC is expected to witness significant growth during the forecast period. Besides, significant research and development activities are carried been carried to improve the treatment of scoliosis.